Depending on the nature of the engagement, Allies for Change draws in a number of resource providers, including the Doing Our Own Work facilitators whose biographies are featured below. All Allies for Change engagements are negotiated by Melanie Morrison, Allies for Change founder and director. Melanie is the author of four books including The Grace of Coming Home: Spirituality, Sexuality, and the Struggle for Justice, and her writing has appeared in numerous journals. Her latest book, Murder On Shades Mountain: The Legal Lynching of Willie Peterson and the Struggle for Justice in Jim Crow Birmingham, was released in March 2018 by Duke University Press. Allyson S. Bolt is a social worker, educator, and advocate for social justice. She has extensive experience working with survivors of domestic violence and with lesbian, gay, bisexual, transgender and queer communities, both in Grand Rapids and in Lansing. She currently works with people who are homeless, providing case management, employment seeking assistance, and group facilitation for people experiencing loss and trauma. Allyson furthered her work in social justice advocacy at The Leaven Center, an organization committed to nurturing the relationship between spirituality and social justice. It was in her work there that she realized the urgent and critical work of continuous examination of her own privilege and that this work must be done from a place of love, hope, and patience. She believes that if we stay stuck, afraid, or silent, we contribute to the oppression. In her spheres of influence, Allyson is committed to uprooting the evils of racism and all forms of oppression. She has a Masters in Social Work from Michigan State University and currently resides in East Lansing, Michigan. As a public school and outdoor educator, Autumn Campbell has witnessed institutional racism through inaccurate and incomplete curriculum, school and district policies, school and classroom rules, microaggressions against People of Color, and social segregation. These experiences have led her to dedicate herself to interrupting and dismantling racist culture in her classroom and at her school. Autumn uses an anti-oppression consciousness to address equity, inclusion, diversity, and social justice in local schools and the broader community. She created and presented professional development workshops, collaborated with Ann Arbor’s Neutral Zone, organized students for both a Social Justice and LGBTQIA Club, and participated in the county-wide diversity forum. Autumn has also created and implemented curriculum for more than 300 students with the Understanding Race Project in 2012, and volunteers with the Washtenaw countywide Culture and Diversity Task Force and the Transgender Task Force. Autumn is dedicated to constant personal and profession development, striving to address and integrate her understanding of whiteness and unearned privileges through continuing education and meditation. She balances her personal growth with her current work at the Washtenaw Intermediate School District where she co-facilitates an in-depth social justice professional learning series for educators. Dessa Cosma is the Executive Director of Detroit Disability Power, a social justice group dedicated to organizing people with disabilities in Metro Detroit. Dessa grew up in the Deep South, splitting her time between New Orleans, Louisiana, and Augusta, Georgia. She has been a social justice advocate for as long as she can remember, starting her environmental, LGBT, and reproductive justice efforts in high school. She attended the University of Georgia, and earned bachelors degrees in International Affairs, Women's Studies, and Anthropology. After graduation, Dessa moved to Detroit to work as the senior field organizer for Planned Parenthood Affiliates of Michigan. Not only does Dessa love organizing, she loves Detroit! She helped organize the US Social Forum, which brought nearly 20,000 people to Detroit in 2010 and also helped organize the 2012 Michigan Women's Power Assembly, which drew 175 activists together for training and strategizing. In 2014, Dessa graduated with a Masters in Social Justice from Marygrove College. At that time, she was the Michigan program director for the Center for Progressive Leadership training hundreds of activists, candidates, and campaign managers across the state. She then became the executive director of the Economic Justice Alliance of Michigan, which she helped to start in collaboration with some of Detroit's best economic justice champions. In many ways, but particularly as part of Allies for Change and the Detroit Equity Action Lab (DEAL), Dessa has been fortunate to learn from and be mentored by trainers, authors, professors, activists, artists, and thought leaders committed to racial justice, dismantling white supremacy, and creating equity. Dessa has tremendous disability pride and is eager to continue bridging the gap between the disability community and larger social justice movements. She has particular interest in building power in the disability community that is deeply grounded in anti-racism and economic justice. Jax Lee Gardner (they/them/theirs) is the center manager of the Arcus Center for Social Justice Leadership in Kalamazoo, Michigan. Jax has spent the last twenty-plus years working in social justice movements, both personally and professionally. Originally from Washington, D.C., Jax holds a master’s degree in English Literature from Western Michigan University, a bachelor’s degree from the College of Charleston, and is a professional birth doula. They previously held an ACSJL Staff Fellowship (2015) examining doula care as a vehicle for community-based anti-racist activism. Jax’s social justice trajectory has closely followed issues of health and economic justice for women and children (particularly as they intersect with queerness and racial justice). Jax also founded the St. Luke’s Diaper Bank to help combat diaper need in the City of Kalamazoo. When they're not busy fighting the good fight, Jax relishes in spending quality time with their partner and two children. Sara Johnson (she/hers) is a founding partner of the Truth & Titus Collective, based in Battle Creek, Michigan. Truth & Titus is a consulting agency dedicated to fostering, co-creating, and sustaining organizational change with equity as the foundation. Prior to the Collective, Sara had a seventeen-year career in secondary education. She then worked as program manager and facilitator with the Center for Diversity and Innovation in Battle Creek, where she helped organizations and individuals understand and commit to racial equity and transformation. Alongside other learning experiences, attending the Doing Our Own Work seminar was pivotal in prompting a major shift in Sara's personal commitment and action to ending racism and all forms of oppression. 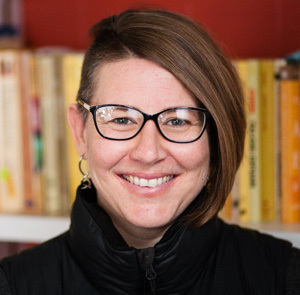 Sara is especially passionate about helping other parents and educators understand how whiteness shows up within those of us who are white and in our practices, encouraging us all to do better. Sara is active in her local SURJ (Showing Up for Racial Justice) chapter. She enjoys speculative fiction and uses this passion to inform her vision of an equitable world. She holds a master’s in Language Learning from Wayne State University. Her partner, Erik, and children — Matteus, Kieffer, and Owen — fill her life with support, joy, and accountability as she seeks to create change toward a world that is worthy of them. Chris Kindy's growing awareness of "whiteness" and "white supremacy culture" has moved her steadily toward "showing up" for racial justice. As a white woman, Chris believes that the work of becoming an effective anti-racist ally is a lifelong process of learning and action; spurred on by life experience, and enhanced by participation in anti-racism and anti-oppression trainings. A native of Battle Creek, Michigan, Chris now lives in Kalamazoo. She recently retired from a forty-year career as a public school educator. During her tenure, she served students and teachers in an impressive variety of capacities -- as a speech pathologist, classroom teacher, district literacy coordinator, district equity coordinator, and literacy consultant to school districts in Michigan, Indiana, and Illinois. She was engaged in the Children's Defense Fund Freedom Schools of Battle Creek for ten years, participating as a member of the leadership team, grant writer, and learner. Along with other community activists, in 2015 Chris helped organize a local chapter of SURJ (Showing Up for Racial Justice) in Southwest Michigan. That same year, Chris participated in the Center for Diversity and Innovation facilitator training; now facilitating CDI White Caucus meetings monthly in Battle Creek. Chris received her Community Coaching Certification from Leadership that Works in 2016. Chris believes that her experience in Doing Our Own Work changed and affirmed her life by opening the door to a new liberation for her soul. She resonates with these words of Nelson Mandela, "I am not truly free if I am taking away someone else's freedom, just as surely as I am not free when my freedom is taken from me. The oppressed and the oppressor alike are robbed of their humanity." 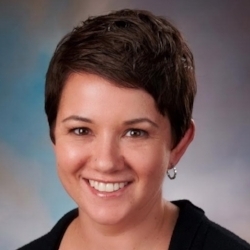 Emily Joye McGaughy is a trainer with the Truth & Titus Collective, a collective based in Battle Creek, Michigan that is dedicated to fostering, co-creating, and sustaining organizational change with equity at the core. She is an alumna of The Pacific School of Religion and Catawba College. She was ordained to pastoral ministry in 2010 and served as associate pastor of First Congregational Church of Battle Creek from 2010-2015. Her work as a facilitator, writer, activist, chaplain and pastor have convinced her that the beliefs and behaviors that most threaten us as individuals, cultures, society and species can be changed--but only with a lot of intentional unlearning and relearning, relentless honesty, relational and communal accountability and intimacy, compassion, forgiveness, and most importantly, love. Emily Joye grew up in the east-side suburbs of Los Angeles, California. Raised by progressive parents, Emily Joye was encouraged early on to take racial realities in the United States seriously. But it wasn't until she came into an awareness of systemic racism in general and white privilege in particular that the work of anti-racism became a matter of personal, not just conceptual, investment. Today she believes that the only hope for global peace and repentance/healing of the American Soul is in the struggle for racial justice. EJ is part of a blended, multiracial, multigenerational, queer family that continues to blow her mind and heart wide open. She loves collage, painting, cooking, deep ecology, writing, and dancing. Karen Pace was a program developer, educator and facilitator with Michigan State University Extension and her work is grounded in social and economic justice and change. She has worked as part of talented and diverse teams for more than 20 years to create efforts that address root causes of complex issues at the personal, interpersonal, institutional and cultural levels. She and her colleagues have provided hundreds of impactful programs and processes for thousands of people across the United States and her work has extended to youth and family agencies, schools, universities, juvenile justice organizations, faith-based communities, businesses, foundations, state and federal agencies and other groups. 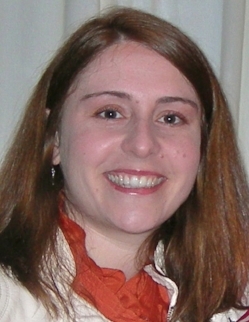 As a white woman, Karen believes that a pathway to deep change is a lifelong process of learning and action focused on addressing white privilege, racial healing and racial equity – as well as the intersections and complexities of identities and forms of oppression across gender, class, disabilities, sexual orientation and other differences. Karen’s expertise and experiences also include addressing issues of bullying, bias and harassment, building authentic relationships and partnerships across differences, and creating safe and inclusive environments that support the healthy development of children, youth, adults, organizations and communities. She is a published author, her print and video curriculum materials are used by a wide variety of organizations across the country and she has received numerous individual and team awards for her work. Grounded in her faith and its commitment to social justice, Lois McCullen Parr believes that anti-oppression works begins in compassion and self-love. As a writer, pastor, and activist, Lois has written about and worked for justice at the intersections of faith, race, class, disability, sexual orientation, gender, and labor. A graduate of Otterbein College and Garrett-Evangelical Theological Seminary, Lois has additional training in mediation, community organizing, and group dialogue. An ordained elder in The United Methodist Church, she has served congregations and worked as an activist for justice for lesbian, gay, bisexual, transgender, and queer people (she is also a trainer for the ecumenical curriculum Building An Inclusive Church). Lois found her life changed by participation in Doing Our Own Work, and continues to grow and learn into living with an anti-racist identity. Lois believes speaking the truth about systems of power, privilege, and oppression is critical to our nation’s need for race reparations. In addition to training with Allies for Change, Lois co-facilitates with Dr. Shayla Griffin a Justice Leaders professional development series for educators in Washtenaw County. Diane S. Schmitz, is an educator, minister, and writer with over 20 years of experience designing and leading transformational group processes. Her primary focus is working with predominantly white communities to increase the awareness and knowledge needed to be effective partners with communities of color in dismantling racism. Diane has 17 years of experience in higher education, serving as a director in Student Development at Seattle University, with focus areas in management, equity and inclusion work, support for marginalized students, university leadership, and teaching graduate-level social justice courses in an adjunct capacity. She is an experienced designer, presenter and facilitator of webinars, seminars, workshops, trainings and conference presentations on multiple topics. As an ordained minister in the United Church of Christ, Diane has a specialized ministry in racial justice that has included leading workshops, retreats, and co-facilitating training for churches seeking to become anti-racist, multicultural communities. She helps church communities to gain insight about how being socialized in a "white racial frame" has created attitudes and beliefs that shape the church and society and daily produce harmful impacts on communities of color. She believes the connection between spirituality and justice is a vital one to nurture. Diane has a Masters of Divinity and an Ed.D. in Leadership from Seattle University. Her dissertation examined Whiteness in Jesuit Higher Education. She currently lives, works, and travels with her partner, Bill, in a 21-foot travel trailer which provides the opportunity to focus full-time on racial justice work. She blogs about spirituality, justice and living and working on the road at sophiasongs.com. Her home base is Seattle, Washington. Diane believes every day provides an opportunity to dismantle some of her internalized white dominance through staying awake, practicing humility, taking personal responsibility for her learning and being accountable to communities of color. Her work for social justice is motivated by a deep belief in the capacity for change in individuals, organizations, and communities. Aaron Wilson-Ahlstrom designs and facilitates engaging learning environments for young people and adults. He currently works as the director of programs at Experience Institute, a Chicago-based organization that develops experiential learning programs for college students and working professionals that combine the best of study abroad and co-op programs. Aaron has come to understand that racism is present everywhere and, while it does not oppress white people, it does damage to them by making them complicit in the oppression of people of color. He sees working with people of color to dismantle white supremacy as therefore critically important as a way back to his own humanity. He received his bachelors degree in social sciences from the University of Michigan in 1995, where he created an individualized concentration to study issues of social justice and the role of education in social change. He returned to University of Michigan for his masters of arts in education and secondary teaching certification in 2000. He lives in Chicago.